The blue links in this letter will take you directly to the documents. Here is the program of this gathering. Churches, Caritas and Diaconia are major providers of social services and healthcare services in many Member States. The ways in which they provide such services depend upon the prevailing legal framework within the European Union and the Member States. With the Directive on Services in the Internal Market, the Communication on Social Services and the announced Communication on Healthcare services, we are facing a number of new developments in the field of social and healthcare services. The Dialogue Seminar was intended to bring together the various players in the area in order to allow for a comprehensive approach in the discussion of current developments. I will send three documents that were discussed at this meeting. The first is a Communication from the Commission regarding the implementation of the “Lisbon program – social interests of general interests in the European Union”. In reading this, you will sense the general attitude that is being developed in Brussels concerning social services in relation to the internal market. The second document is another communication regarding the European Community and heath care services. The third document is a first response to the “Services Directive” issued by CEC, COMECE, Caritas Europa, and Eurodiaconia. The Dialogue Seminar referred to these documents. I would suggest that you read them so as to familiarize yourself with the spirit and the language of those who make policies within the EU. In between the lines, there are some aspects that we as chaplains can relate to. After you have had a chance in reading these documents, we can discuss them in a open discussion via the Yahoo Group. During the Dialogue Seminar, all the officials of the EU stressed the importance Churches play in the area of social services and public health. Unfortunately though, there really was not too much “dialogue”. During the first session, in which officials of the EU Commission spoke, there was only time for four questions to be asked. During the second part of the seminar, which dealt with social services within the internal market, I believe that only three comments were made from those who attended. What was obvious, particularly in the second session regarding the internal market, was the technocratic approach to social services and public health, something that we, who serve in the corridors of health are not so much familiar with, a language that we do not use and does not express our work. Due to the lack of opportunity to engage in real dialogue, I was not able to present the difficulties that chaplaincy faces in Europe during the seminar. In the debriefing session that was held after the meeting with representatives who had taken part in the dialogue, I was able to emphasize that we as chaplains are on the front line in public health in bringing spiritual care to those in health care institutions and cited that our position is very often hindered, both by the medical community and the political community. What came out of attending this seminar? The first thing is that we were included. This is recognition that we are considered as a central part in the dialogue with Churches and the EU in the area of public health. The second is that I was able to make person to person contacts with officials of the European Commission, CEC and the COMECE. Upon arriving in Brussels, I was joined by Anne Vandenhoeck of Belgium and Dana Kalnina-Zake of Latvia. 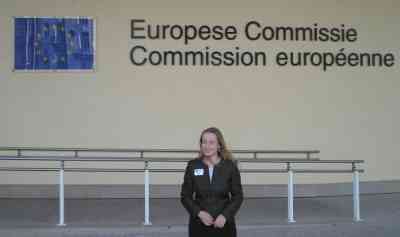 Dana came to Brussels to represent the Lutheran Church of Lavtia at the Dialogue Seminar. After a nice lunch together, we first met with Dr. Michael Weninger, the Policy Advisor for Religion for the European Commission. It was a very brief meeting where we gave him a thank you letter for his greeting to our Lisbon Consultation. He greeted us with great warmth and showed much interest in the Consultation. We informed him about the Statement on Palliative Care and asked that he support our efforts having palliative care discussed with the Commission. He was positive in helping in this effort. The next day, Dr. Weninger made the closure of the Dialogue Seminar. I felt most honored that he came out of his way to tell me good-bye. Following this meeting, we were welcomed by Mr. Maragretas Schinas, Director General of the Office of the Commission for Public Health. Here too, we presented a thank you letter to Mr. Schinas for Commissioner Kyrianou's greeting to our Consultation, in which we informed him of the Palliative Care Statement and made a formal proposal that a meeting be called to begin discussing this significant area of care within the EU Commission. Mr. Schinas was very receptive to our proposal. He explained that over the years, the European Commission has been cautious in imposing regulations on EU countries in the area of health care, but that it seems that there is a growing need to discuss certain areas of care that are of general importance. This has been done in the area of mental health. He feels that palliative care is another area in which this needs to be done. Mr. Schinas asked that we help him organize the meeting that we propose, suggesting participants that could attend. We agreed that we would try to hold this meeting by this coming spring. Mr. Schinas addressed the Dialogue Seminar the day after our meeting. It was obvious in his remarks that our meeting with him played a role in the thoughts he expressed. After reading the above, I am sure that you will agree with me that that our “appearance” in Brussels was beneficial. We now have our work cut out for us. I will be informing you in the near future of further developments.